The Waterloo Historical Society’s annual volume has been published since 1913. A copy is included with membership in the Society. Each issue reflects articles submitted during the previous calendar year. Currently, the publication committee begins work on the annual volume in late summer (e.g. summer of 2025). It continues over the fall and winter. The volume would then be released in May 2026 at a WHS meeting and would bear the date 2025. Articles should be submitted as early as possible for inclusion in the current year’s volume. The cut-off date for consideration is September 30, current year. Submitted articles must deal with some aspect of the history of Waterloo County/Region either in totality or in part. To discuss and submit an article contact our editor rych mills at 519 742-4990. View the Style Guide for information about submitting manuscripts to the WHS publication committee. WHS has a supply of back issue annual volumes for sale. They are priced according to rarity. Many of the rarer back issues have been returned to the society by previous owners but all are in acceptable condition. NFS means that WHS either has no — or very few — copies in stock. We are especially interested in receiving donations of these years or even purchasing them. Annual volumes listed at $25 may at any time become NFS: prices in other categories may also change at any time. Except in the $10-and-under pricing levels, plus the current issue and the most recent issue, WHS does not usually sell multiple copies of a single year. To inquire or order items, contact rychmills@golden.net or 519-742-4990. Give your annual volumes a new home in your home! These attractive wine-coloured holders ensure your volumes stand neatly, are readily accessible and are protected from bends and scratches. They were produced at Cober Evolving Solutions, long-time printer of our annual volume, and purchased in bulk so we are able to offer them to members at $6.50 each or 3/$18.50; and to non-members at $7 or 3/$20. Each one holds approximately ten of the recent size volumes and 15 – 20 of the earlier ones. An entire set of 100 volumes fills six. 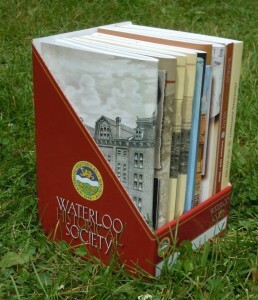 Slipcases are available at all WHS meetings and at the Victoria Park Gallery, 85 Schneider Avenue, beside the playground. The Gallery is open Sunday and holiday afternoons until mid-November. Other arrangements can be made for pickup or possible special delivery by contacting rych mills. Postage and packaging will be expensive if mailed because of the odd shape. Note that they are not available at the Grace Schmidt Room at Kitchener Public Library.